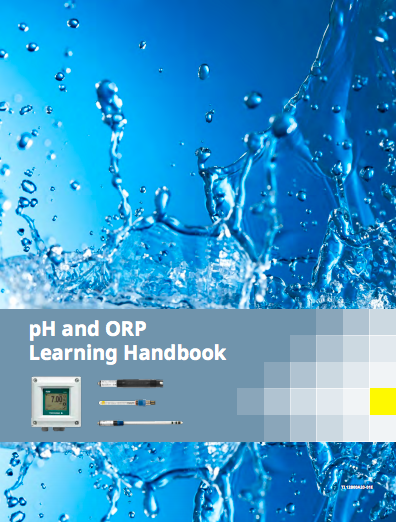 Obtaining accurate pH and ORP measurements from your analyzer and interpreting this data correctly is critical to ensuring product quality and making accurate predictions of sensor lifetime. 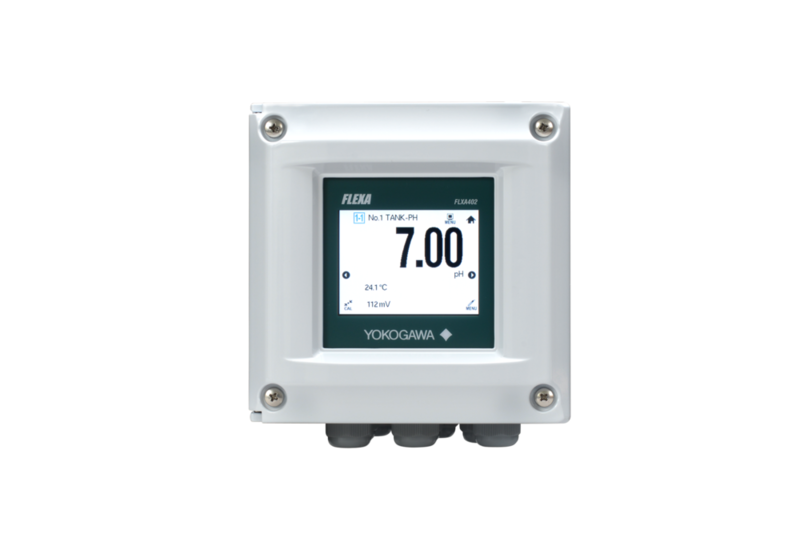 Yokogawa’s pH and ORP measurement solutions include 2-wire and 4-wire analyzers featuring real-time online sensor diagnostics to provide reliable results. Our pH and ORP analyzers use the latest analyzer sensor technology to improve predictive maintenance and reduce the time and costs associated with sensor maintenance and replacement, optimizing your OPEX. For industrial applications and particularly for automatic process measurements it is of the greatest importance that the sensistive part of a glass electrode and the diaphragm of areference electrode are kept clean. Purified water has very low conductivity, which means it is high in resistance because all the conductive components have been removed. In low conductive solutions combined with its susceptibility to contamination and temperature effects, makes accurate pH measurement very difficult. Pure water and ultrapure water is used in a variety of industrial processes such as semiconductor, power, water and pharmaceutical industries. 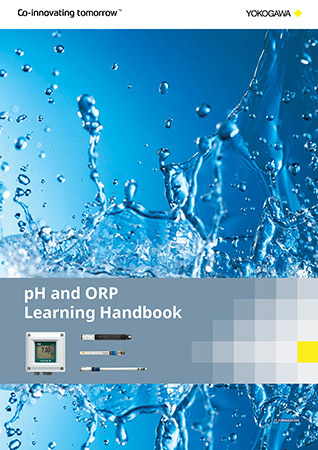 Achieving accurate and reliable readings using a traditional pH analyzer is challenging, however with the right equipment stable and accurate pure water pH measurements can be accomplished. 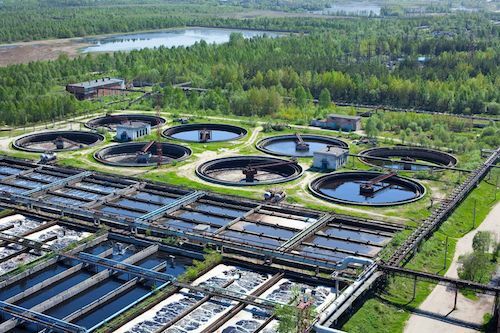 Water quality is crucial in all areas of life to process industrial automation. 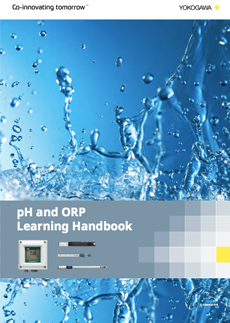 Applications such as aquaculture and chromium wastewater treatment rely on accurate pH and ORP measurements to ensure safe pH levels or proper control of chromium reduction processes. 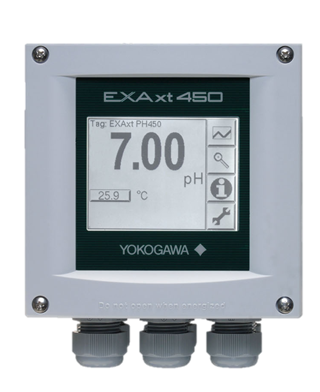 Yokogawa's 4-wire and 2-wire pH analyzer solutions with suitable immersion fitting and sensors are ideal for measuring these crucial pH and ORP measurements. 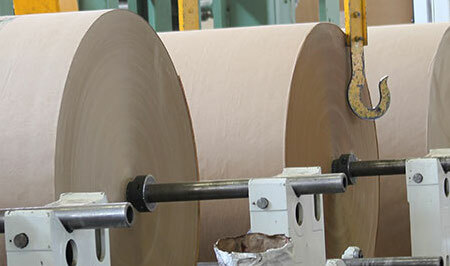 The demanding applications and severe process conditions in pulp mills pose challenges for accurate, repeatable and reliable liquid analysis measurements. Treating wastewater from pulp and paper plants requires maintaining proper pH levels, which can be controlled by referring to a pH analyzer. 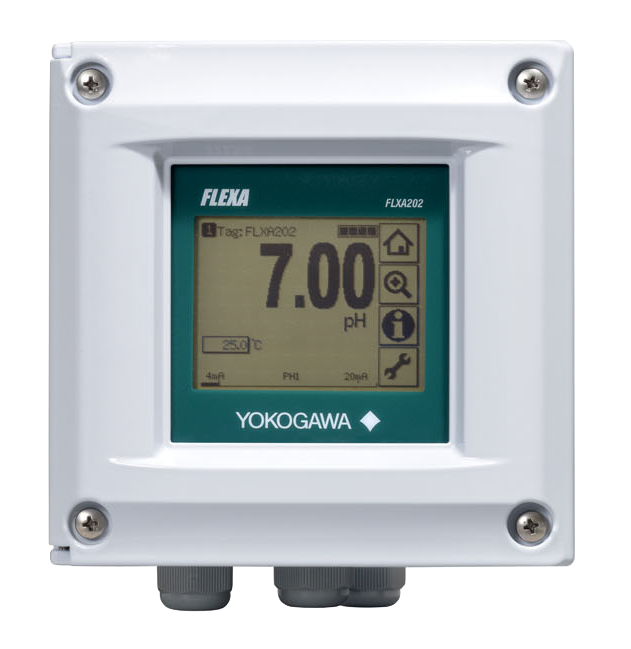 Yokogawa pH and ORP analyzers include real-time sensor diagnostic and predictive maintenance features to continuously and stably measure pH levels, eliminate the need for frequent manual cleaning, and enable efficient use of flocculating agents. The chemical industry presents multiple challenges such as chemical attacks, maintenance, safety, consistency and reliability to any liquid analysis measurement. In flue gas desulfurization systems that use magnesium hydroxide (Mg(OH)2 ) slurry, the consumption of the desulfurization agent (Mg(OH)2 ) is controlled using online pH analyzers. 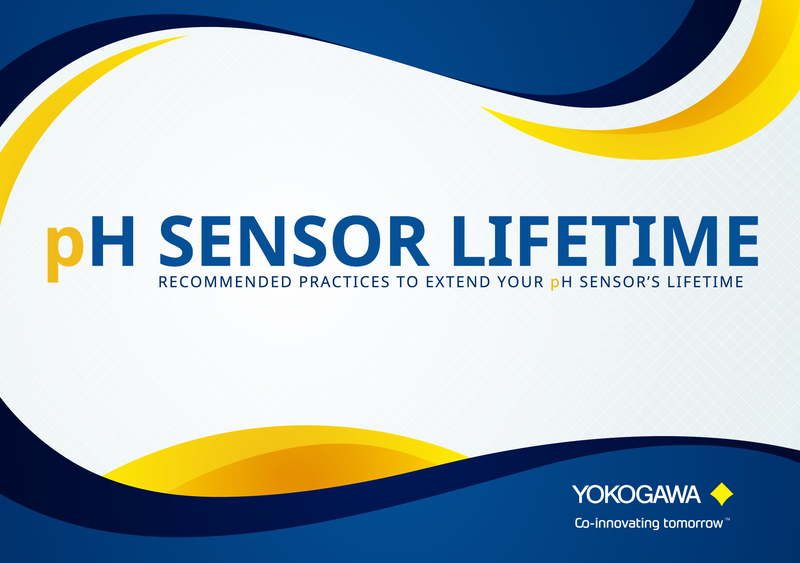 Yokogawa’s pH measurement solutions ensure stable, continuous pH measurement over long periods, reduce operating costs, and eliminate manual cleaning. In stable dispersion of fine particles is the pre-requisite for the selective flocculation technique involving separation of ultra-fine valuable particles from the gangue. Among mineral processing techniques selective flocculation technique is known to have outstanding potential of capturing the particles of particular mineral in slurry of mixed mineral system by selective adsorption of water soluble polymers known as flocculants. Brewery is facility to produce beer. Breweries process is the manufacturing process of beer, which is a fermented beverage with low alcohol content made from various types of grain. Wheat, maize and other grains can be used for this. Brewing process starts from malted barley that is to form a mash by milling and mixing with hot water. The malt starches are converted to sugars during this process. This sugar rich water is then strained through the bottom of the mash and will be called as "wort". Then the wort will be brought to boil by bringing to the brew kettle. For bitterness or aroma hops are to be added at different times during the boil. Then the wort is cooled and aerated. And brewers yeast is added for fermentation. From the sweet wort the yeast produces carbon dioxide, alcohol and other byproducts. The GREEN BEER undergoes maturation after fermentation. Filtaration and carbonation are the last steps. Finally the beer will be stay in holding tank until it is bottled or kegged. After extraction from sugar cane or sugar beets, juice must be purified to remove the many other organics and minerals that accompany it. The processing to accomplish this is heavily dependent on reliable pH measurement and control as illustrated.